Solihull Sports Injury Clinic offer advanced physiotherapy treatment from our sports physiotherapists. Core exercises can be performed using an exercise ball and help restore postural and core muscles. 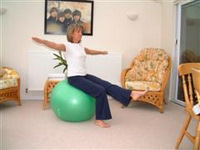 Home exercises can be carried out to strengthen postural muscles and prevent unwanted injuries. 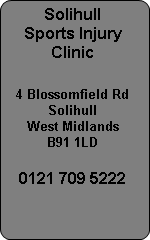 Solihull Physiotherapists at Solihull Sports Injury Clinic provide physiotherapy treatments for sports injuries. Our highly trained staff are experienced in running injuries and all sports and training regimes and can offer you the best advice available. Electrotherapy, ultrasound, interferential and mediwave are used daily to promote faster healing of soft tissue injuries like muscles, tendons and ligaments. Stretching and strengthening exercises can help rehabilitation of injured muscles and proprioception training will help restore balance and promote injury prevention.